Revolutionary Road changed my life (the book, not the movie, I haven’t seen the movie and I never will). I was about 2 years married when I first read Revolutionary Road. As a fan of Richard Ford I was drawn to the novel because of his prologue to a new Methuen edition. Clearly that says something about my affection for middle American fiction that examines family life. What took me by surprise about Revolutionary Road was how much it challenged my own preconceptions of marriage, of middle class interaction with society, of what others might expect of me, and of settling. I wasn’t afraid of the suburban life April and Frank were living, and I thought their ambitions were unrealistic. But Yates’ prose and simplicity and capture of how easy it is to just accept something less than perfect really touched me. My less than perfect was nowhere near April’s. And my life since has not been extraordinary. 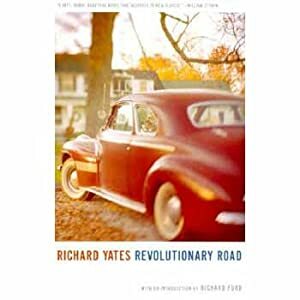 But Revolutionary Road made me face up to the cracks in my own marriage and gave me the impetus to make changes before those cracks became irreparable fissures, such as occur in Revolutionary Road. I re-read Revolutionary Road a few years ago. I was in a stable relationship with an amazing and far from Frank Wheeler man, but I was slightly apprehensive as to the power of the novel. Thankfully it just made me appreciate what I have all the more, and made me realise that the choice I made after my first reading was the right one. That first copy of Revolutionary Road sits right by my front door, and in case of fire, it will be the third thing I grab after my two cats (I’m assuming my not Frank will make it out by himself).